128 extra presets for the Morphine Plugin program. 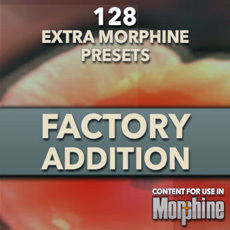 The Morphine Factory Addition gives you an extra range of high quality presets to use inside the plugin. Note that these presets can only be used in the registered Morphine Plugin. available for $159 USD in our web shop. Find below the extra presets of this package.